This is a teaching, but not all teachings are the same. There are different categories of teaching: The first category is simply the passing on of facts. That’s the easiest type of teaching to engage in; anyone with a functioning brain can put facts into their heads and store them. It’s not so much learning as memorisation. Then there’s the teaching that involves the passing on of skills, for example musical skills. This is more difficult and requires some aptitude in the Character, a certain kind of brain that responds to the mathematics and beauty of music. Studying something like science or philosophy is different again: These subjects require a higher level of intelligence, clear thinking and logic because they involve the intellectual understandingof concepts. Whether it’s facts, skills or understanding concepts, all of these types of teaching are based on the student acquiring ‘head knowledge’. Even music, which obviously involves the body learning to physically play an instrument, is based around the understanding of music theory. Teaching about Waking Up, which deals with metaphysics, is another thing altogether. Information is imparted to you, yes – but that’s just preparation of the soil in which the seed grows. In a subject like science, understanding the concepts is the end result; the teaching has done its job and reached its fulfilment. With thisenquiry, understanding the concepts isn’t the end of the process; it’s just the beginning. The only real fulfilment of thisteaching is when the student has first-hand, existential experience of what’s being taught. The germination of the seed is when you actually taste life beyond Personality – but that doesn’t happen as an outcome of learning or even understanding the concepts. So then, you might ask, how doesit happen? Anyone teaching about life beyond Personality finds themselves in a paradoxical position. Unlike all other areas of ‘study’ – for want of a better word – they’re teaching something which the student already knows, but has forgotten. To put it another way, the student knows it, but they don’t know that they know it. This is obviously not the case in most teaching situations. Normally the setup is: The teacher knows, the student doesn’t know; the teacher passes on the knowledge until the student knows it too. Because, somewhere inside, you know this – your interaction with this teaching is not really about learning anything new; basically it comes down to you finding in yourself what you already know. The teacher is just trying to remind you that it’s there; to jog your memory. 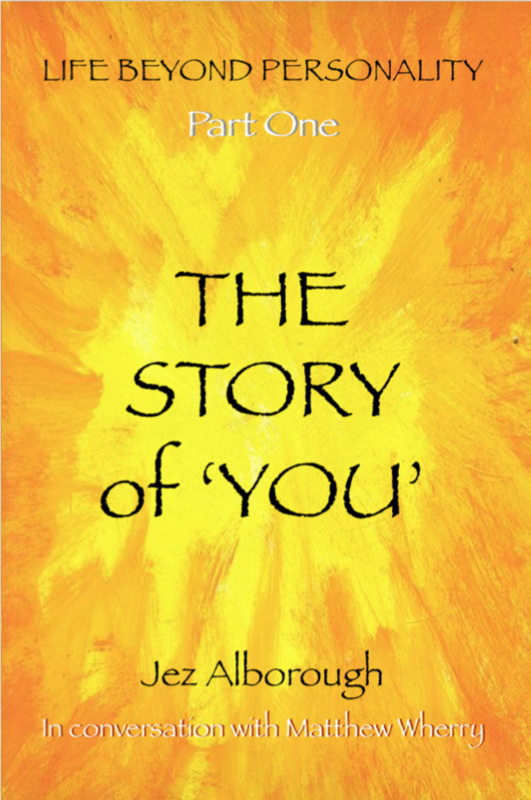 In my book ‘The Story of ‘You’ I approach the subject of life beyond Personality from many different angles. I’m throwing all this ‘knowledge’ at the reader; any part of it could be the trigger, the thing that jogs the memory. Your Personality doesn’t want you to engage in this enquiry: Why would it? This is a teaching which points to life beyond Personality; the last thing it wants you to do is get involved with this teaching which spells the end of its control of your life. So my writing endeavours to reach pastyour Personality and its resistance, to find a connection to the one in you whoknows. Understanding the concepts is easy; the fulfilment only begins when that one in you who knows starts to Wake Up and respond. Thank you Jez … Do continued to jog away at my memory! I have to say each time I dive into The Story of You … Something new seems to appear. It reminds me of a child’s pop-up book. It’s as though the words are the same, but a new pop-up appears with something new to see, while the words becoming a less significant backdrop. So looking forward to your new book ‘The Infinite Journey’.